Located on the southernmost tip of Yeongdo-gu, Taejongdae park is a natural park and one of the popular tourist attractions of Busan. Its white lighthouse overlooking the green sea and the observation deck makes the entire park look exotic. You can just walk down the lighthouse, have your own time and can enjoy having fresh raw fish on the rocky shore. However, the distance between the entrance gate and the lighthouse is quite long. So, if walking is not your genre, you can take a tour course or buy tickets of Danubi trains. Whether you come with your family or with your spouse, you are definitely going to fall in love with the scenic beauty of this place. On clear sky day, you can even spot Tsushima or Daema, Island of Japan from the rocky cliff. At the edge of the rocks, food tents are there where you can take a quick bite and can again walk around the park. From the dock, mini cruise ship trip are also there to move around the cliffs. 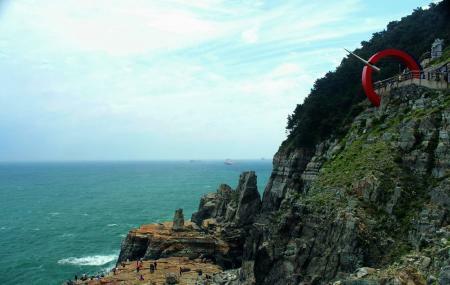 Also, visit the popular attractions in the city by following Busan itinerary 1 day. Pets are allowed but must be on leash. Carry plastic bag to dispose of pet litter. Baby stroller are not available on rent. Vehicles are allowed for parking, after 9:00 am. Danubi trains are available on every 20 to 30 minutes. Wheel chair rental facility is available. Free train rides for children below 4 years. Parking area– 9:00 am to 6:00 pm. 20% discount for people holding city tour pass. Take bus no – 88 or 101 from Busan bus station and get off at Taejongdae Park. Other buses for Taejongdae Park are 8, 13, 30. How popular is Taejongdae Park? People normally club together Gamcheon Cultural Village and Gwangalli Beach while planning their visit to Taejongdae Park. Tons of things to do here. Total route is around 5km. So prepare a good walking shoes to trek here. There is also a cheat whereby paying just a small sum of 3000 won per person will allow you to take a cute train ride going to all the scenic spots. You are allow to disembark and board the train again at all stops. The light house is a good trek where you will walk down to the light house. Further down you will reach a seafood stall where you can order the fresh sashimi to eat with a view to boot as well. Further down the stall is a beach with smooth pebbles as sands. Visited 3 main attractions via the train which costs 3k won per pax :) Spent about 3 hours odd there. Loved the lighthouse area the most! Recommended to come here early morning or afternoon so that you can enjoy the train ride around these 3 main attractions. But of course if time permits for you, you can walk and see more than just these 3 sites. Beautiful park to spend a few hours at. All the sites are along one path and it's very easy to follow. Amazing views of the cliffs, oceans, and surrounding islands. The whole circuit takes about 1-3 hours to walk, depending on how often you stop. There is also a train/car that circles around the park and stops at all the main sites. Best place in Busan for a day out. Quite a big area, make sure to keep time in your hands, at least 3 hours to cover the whole area. There are also various facilities inside, temples, monuments, sea beaches etc. Nice place.. there are around 11 attractions and the park is huge..there is a train for people who cannot walk far. Lighthouse, Observatory, pebble beach, taejong temple are must see places.. there is also a ferry service near pebble beach..